BOSTON, Mass. 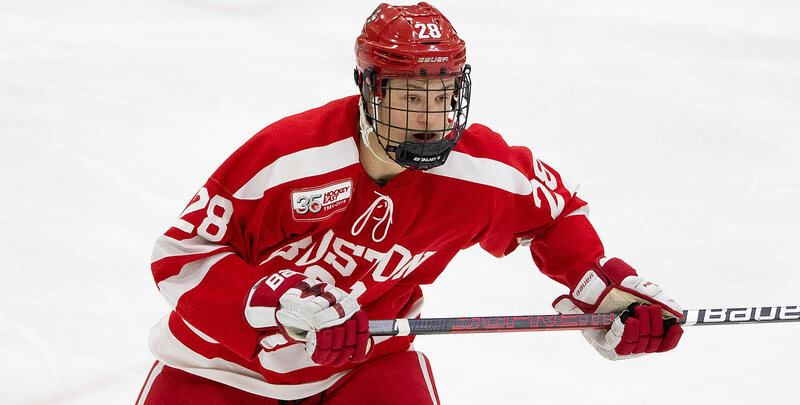 - Freshman Joel Farabee scored two goals, including the game-winner, to help the Boston University men's ice hockey team post a 4-2 victory over No. 17/15 Arizona State in the opener of a weekend series at Agganis Arena on Friday evening. After giving up the game's first goal, the Terriers reeled off three straight goals and junior Jake Oettinger turned in a 38-save performance to help the team move over .500 at 10-9-3. The Sun Devils fall to 16-10-1 on the year. Senior co-captain Bobo Carpenter assisted on both of Farabee's goals to reach and then pass the 100-point mark for his career, becoming the 83rd Terrier to reach the milestone. - Arizona State used a strong forecheck to get on the board first as Filips Buncis won a puck battle before finding Anthony Croston at the right crease just 5:58 into the contest. - BU came up with an equalizer less than five minutes later and never trailed again. - An ASU pass went off Carpenter's skate to freshman Jack DeBoer, who found Farabee in the low slot, where he stickhandled the puck around ASU netminder Joey Daccord before tucking it inside the right post. - The Terriers would take a lead they would not relinquish in the final minute of the first when junior Patrick Curry notched his seventh goal of the season off assists by junior Patrick Harper and sophomore Ty Amonte. - Farabee doubled BU's lead at 7:16 of the second from the left corner of the ASU zone as his backhand attempt went off a Sun Devil defender at the goalmouth and past Daccord. - Under two minutes later, ASU got one back when a center-point blast from Brinson Pasichnuk glazed off a BU player and past the reach of Oettinger. - BU regained a two-goal cushion at 12:51 of the middle stanza when junior Chad Krys took a cross ice pass from senior Ryan Cloonan before flinging the puck off an ASU player and in. - The Sun Devils threw everything at Oettinger and the BU defense in the third, recording 17 shots on goal in the frame, but the Terriers were up to the task and came away with the 4-2 win. - The Terriers are now 6-1-1 in their past eight contests. - BU got a game-high five blocked shots from junior Dante Fabbro, who also notched an assist to extend his point streak to five games. - Sophomore Shane Bowers also pushed his point streak to five games after assisting on the Krys goal. - Daccord made 28 saves for the Sun Devils, who held a 40-32 advantage in shots. - Both teams went 0-for-2 on the power play. - The teams will wrap up their weekend series on Saturday (Jan .26). - Game time at Agganis Arena is set for 7 p.m.